US President George W Bush has said he wants to "know the facts" about Iraq's alleged weapons of mass destruction. The White House has been under pressure to set up an investigation into why no weapons have been found in Iraq. In his remarks on Friday, Mr Bush did not address whether an inquiry would be set up as recommended by the ex-chief US arms inspector David Kay and others. Those calls have been fuelled by a White House admission that the pre-war intelligence may have been flawed. National Security Adviser Condoleezza Rice on Thursday became the first senior member of the Bush administration to acknowledge publicly that the data used as the key argument for invading Iraq may have been wrong. President Bush said he wanted to be able to compare what was found by the Iraq Survey Group formerly headed by Mr Kay with what had been thought before the war. "I want to know the facts," he said. Ms Rice's admissions are being seen as a painful necessity after Mr Kay's testimony to Congress that he did not believe that there were significant stockpiles of banned weapons in Iraq before the war. Opposition Democrats have urged a wide-ranging investigation into the apparent failures and similar calls have also been made by influential Republican Senator John McCain. The BBC's Justin Webb in Washington says the demands for an inquiry into the pre-war intelligence could force action from the White House. Should there be an inquiry? "The pressure could become unstoppable," he says. "This is now a serious issue in American politics - one that the president has to address." But our correspondent says the lack of WMD is regarded as a separate issue to whether the war was justified. 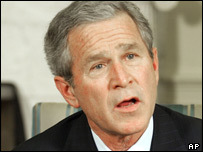 On Friday, Mr Bush reiterated his view that ousted Iraqi leader Saddam Hussein had been a "danger". "We dealt with the danger, and as a result, the world is a better place and a more peaceful place, and the Iraqi people are free," he said. In Britain, pressure is also growing on UK Prime Minister Tony Blair to set up an inquiry into the pre-war intelligence. His office echoed his American allies in saying the war was necessary to stop an imminent threat from an Iraq armed with weapons of mass destruction. But Robin Cook, a former UK cabinet minister who resigned in the run-up to war, told the BBC: "I just don't see how Tony Blair can hold the line that he was right when everyone else is now admitting they were wrong." Mr Blair is expected to be challenged on why he is sticking by the WMD arguments when he appears before a committee of senior members of parliament on Tuesday. A spokesman for Mr Blair has dismissed calls for an inquiry into the gathering of intelligence and said the Iraq Survey Group should be given time to finish its work. No deadline has been set for the inspectors to complete their search. US defence expert Anthony Cordesman told the BBC that the so far fruitless search for alleged weapons of mass destruction revealed problems in the gathering of intelligence from Iraq and its subsequent analysis, much of which he described as "sophisticated guesswork". He said the difficulties in getting good information from Iraq also had a bearing on arms control elsewhere, such as in Iran and North Korea. "They simply have to be addressed," he said. "If the US intelligence was wrong - who is to blame?"